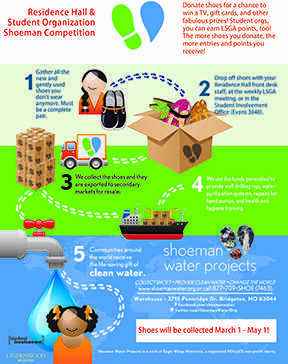 Three Lindenwood organizations are collecting shoes to benefit the Shoeman Water Project, an organization that provides clean water to communities around the world. Student Government, Residential Life and Student Involvement will be collecting gently used shoes between March 1 and May 1 for the Shoeman Water Project Battle of the Boot. According to Angie Royal, director for student involvement, these shoes will be exported to secondary markets for resale. “The funds generated are used to provide clean water to communities around the world,” said Royal. According to shoemanwater.org, there are approximately 784 million people that do not have access to clean drinking water and as many as 2.2 million people die annually from diarrhea as a result of contaminated drinking water. Students who donate their shoes have the opportunity to win big. “For each pair of new or gently used shoes students donate, they will be entered into a raffle for some fabulous prizes, including a TV, gift cards and more,” said Royal. Not only that, but LSGA-recognized student organizations can also receive points per pairs of shoes donated, according to Regan Cole, president of LSGA. Cole believes that this contest is a great opportunity for students to give back. Shoes can be donated at residence hall front desks, in the Student Involvement Office in Evans 3040 or at the weekly LSGA meeting.